^ Grant Hayter-Menzies, Pamela Kyle Crossley (2008). Imperial masquerade: the legend of Princess Der Ling. Hong Kong University Press. p. 89. ISBN 962-209-881-9. http://books.google.com/?id=sNPFc7kkjwAC&pg=PA88&dq=muslim+dong+fuxiang#v=onepage&q=cracking%20of%20fireworks&f=false 2010年10月31日閲覧。. ^ Eight-Nation Alliance in Section 4 Archived 2008年12月2日, at the Wayback Machine. ^ Benjamin R. Beede (1994). 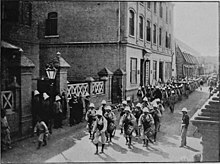 The War of 1898, and U.S. interventions, 1898–1934: an encyclopedia. Taylor & Francis. p. 50. ISBN 0-8240-5624-8. http://books.google.com/?id=48g116X9IIwC&pg=PA50&dq=prince+tuan+replaced+prince+qing#v=onepage&q&f=false 2010年6月28日閲覧。. ^ Sondhaus 1994, p. 139. ^ a b c d Sondhaus 1994, p. 140. ^ Bodin, Lynn (1979). The Boxer Rebellion. Osprey Publishing. p. 34. ISBN 9780850453355. http://books.google.com/?id=2YleP1OP4HsC&lpg=PA34&dq=British%20Regiment%20%22Boxer%20rebellion%22&pg=PA34#v=onepage&q=British%20Regiment%20%22Boxer%20rebellion%22&f=false 2013年1月22日閲覧。. ^ Harrington, Peter (2001). 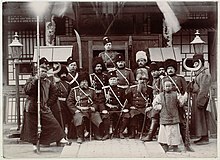 Peking 1900: The Boxer Rebellion. Osprey Publishing. p. 29. ISBN 9781841761817. http://books.google.com/?id=xxE6rybpvHQC&lpg=PA29&dq=British%20Regiment%20%22Boxer%20rebellion%22&pg=PA29#v=onepage&q=British%20Regiment%20%22Boxer%20rebellion%22&f=false 2013年1月22日閲覧。. ^ Raugh, Harold E. (2004). The Victorians at War, 1815-1914: An Encyclopedia of British Military History. ABC-CLIO. p. 177. ISBN 9781576079256. http://books.google.com/books?id=HvE_Pa_ZlfsC&lpg=PA177&ots=8CE3exdB5z&dq=%22British%20units%22%20Boxer%20rebellion&pg=PA177#v=onepage&q=%22British%20units%22%20Boxer%20rebellion&f=false 2013年1月22日閲覧。. ^ Lee Lanning, Colonel Michael (2007). Mercenaries: Soldiers of Fortune, from Ancient Greece to Today#s Private Military Companies. Random House Digital, Inc.. p. 105. ISBN 9780307416049. http://books.google.com/books?id=bnnIIHaj6LIC&lpg=PA105&ots=H4-GpJbH3G&dq=%22British%20units%22%20Boxer%20rebellion&pg=PA105#v=onepage&q=%22British%20units%22%20Boxer%20rebellion&f=false 2013年12月22日閲覧。. ^ Plante, Trevor K. (1999年). “U.S. 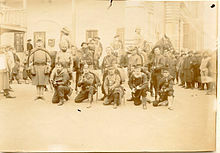 Marines in the Boxer Rebellion”. Prologue Magazine (United States National Archive) 31 (4). http://www.archives.gov/publications/prologue/1999/winter/boxer-rebellion-1.html 2013年1月22日閲覧。. ^ Robert B. Edgerton (1997). Warriors of the rising sun: a history of the Japanese military. W.W. Norton & Company. p. 80. ISBN 0-393-04085-2. http://books.google.com/?id=wkHyjjbv-yEC&pg=PA70&dq=sugiyama+akira#v=snippet&q=raped%20woman%20attractive%20marine&f=false 2011年4月25日閲覧. "Several U.S. Marines, hardly squeamish men, were so sickened by what they saw that they violently restrained some of their more rapacious German allies, leaving at least one wounded." Sondhaus, Lawrence (1994). The Naval Policy of Austria-Hungary, 1867–1918: Navalism, Industrial Development, and the Politics of Dualism. Purdue University Press. ISBN 1-55753-034-3.